WHY, HOW AND WHERE ISRAEL SHOULD ATTACK IRAN NOW. This article was begun on 9/11/2015. When complete, it will look at potential Iranian military and nuclear targets that Israel may be forced to attack now that the Senate has failed to block the nuclear capitulation carried out at the order of President Obama. It is assumed that Israel will begin the attack with an Electromagnetic Pulse (EMP) weapon detonated high enough over Iran to wipe out Iranian electrical power, communications, and radars. Such a weapon will not directly kill many people on the ground although there may be a few deaths in hospitals that lose power, in elevators, or in cars or trucks that suddenly lose power. It is assumed that some military targets like the naval case at Bandar Abbas will be hit by low yield tactical nuclear air bursts. Air bursts do not produce radioactive fallout, although people close enough to feel the heat will receive initial radiation that will cause radiation sickness or death. 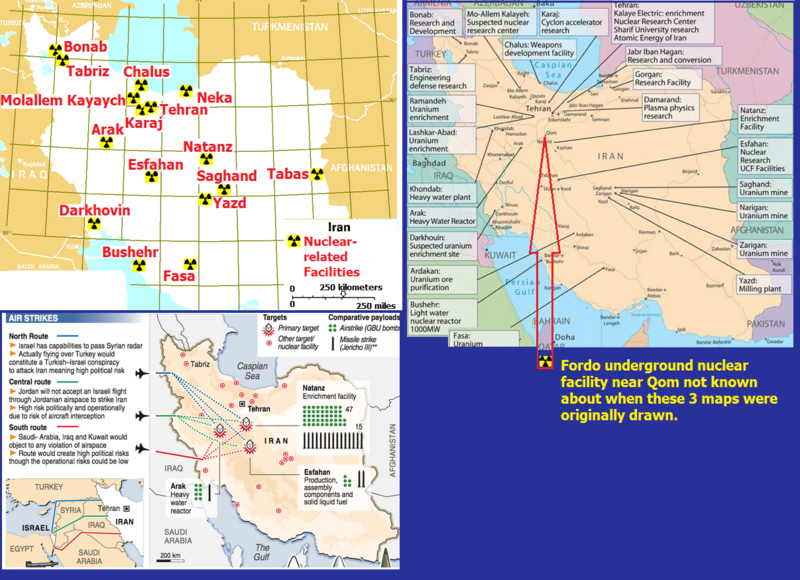 As for underground sites like the nuclear facilities at Fordo, Israelis will have to choose between Special Forces operations that rely on power and communications disrupted by the EMP weapon/s or low yield tactical nuclear weapons ground bursts that do produce limited amounts of radioactive fallout. NOTE TO U.S. AND ISRAELI INTEL: This page was visited on 3/19/2018 by IP Address 2.191.115.80 which is the Information Technology Company (ITC) of Iran. 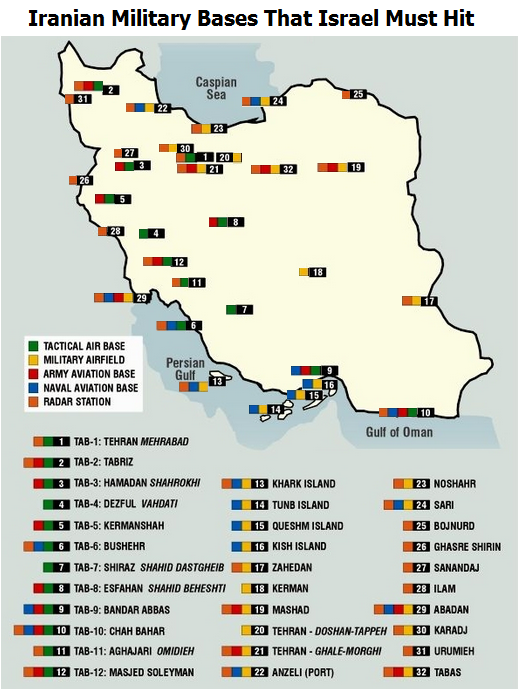 Wikipedia lists the Iranian tactical air bases and military air fields shown below. Note that some of the information (from 1990) is 25 years old. The aircraft shown above are old and clearly not up to combat with the Israeli Air Force. Since I put up the first draft of this article Iran reached a deal with Russia to buy and co-produce the Su-30 fighter jet. Iran will get 250 of the jets. They will be essentially paid for by the U.S. Traitor in Chief Barack Hussein Obama who has freed up $150 billion to give Iran as a reward for them promising to put off nuclear arms production for a decade. Of note, Obama just conceded that Iran is not living up to the spirit of its agreement. Surprise, surprise, surprise.... not! If Donald Trump was correct in stating that a side deal of the nuclear agreement with Iran is that the U.S. will defend Iran from from an Israeli attack, then Israel should have attacked before the U.S. had the chance to position an aircraft carrier back in the Persian Gulf. Now it must wait for another hiatus. If it fails to do so then Israeli pilots, when low on fuel after the attack, may have to face American pilots on the their way to or back from Iran. It is also possible that if Israelis must face American air opposition it may have to rely on a heavier launch of nuclear weapons by ballistic missile or cruise missiles fired from its submarines. It is quite possible that this deal could cause a war between the United States and Israel. However, ever day that Israel delays in launching its attack is another day that Iran get closer to not just an Su-30 equipped air force and nuclear armed missiles that can hit Israel, but also closer to ICBMs that Iran can use to hit America. Ironically, Israel may have to go to war with the U.S. in order to defend it from Iranian ICBMs. This is weird, but it's weird that American legislators could not understand that Obama is a traitor whose top priority is destroying America. Obama should gave been impeached long ago. But he was not, in large part, because politicians are more concerned about the black vote than they are about national defense. The treason we are suffering from is best documented in a FoxNews.com video entitled Rising Threats - Shrinking Military. Update (typo corrections) of November 1, 2018. The good news at this point in history is that President Trump has moved our U.S. Embassy to Jerusalem and it appears that North Korea will accede to Trump's demand to demilitarize. That makes North Korea a less dependable ally of Iran. We no longer have to worry about Israeli being blocked from attacking Iran by the U.S, and our New President has withdrawn from the Iran Nuclear (suicide) accord. However as I made clear in my Atomic Train article there remains a chance that a nuclear weapon could be smuggled out of North Korea by train at the North Korean-Russian border and that the destination will be Iran. Now that we are out of the Iran nuclear accord Iran is threatening to ramp up its own efforts to efforts to make nuclear weapons. As long as this is so, Israel must be prepared to strike in a manner that will minimize civilian casualties although Netanyahu is doing what he can to help foster a revolution to overthrow the mullahs along the lines of showing Iranians how to overcome drought problems. Israel once had its largest embassy in Tehran. Let's hope that with President Trump's help Iran can be turned into a friend again rather than to a pile of nuclear waste.